Most Lesjöfors Sport Springs are TÜV compliant. Lesjöfors are certified to the ISO/TS16949:2009 quality management system. This automotive sector-specific quality management system applies to design, development and production of automotive products at Lesjofors. All coil springs delivered by Lesjöfors are quality assured and manufactured by the company. Lesjöfors only use spring steel material from suppliers who can meet the highest demands for both internal and surface quality. All suspension spring designs are quality verified and manufactured with the best technologies available. The load and deflection parameters are assured by quality control throughout the production process. 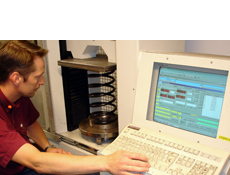 To verify that the result is within given tolerances a final load testing of every batch is made before surface treatment, as shown to the right. The load at rebound length, length at kerb weight, load at bump length and the spring rate are the most important measurements. Surface treatment is made with an advanced zinc phosphate system method, which together with powder paint ensures galvanic protection against corrosion, and a good cosmetic finish. The large number of spring products in the aftermarket and the importance of identifying the correct product make identification labelling very important. To guarantee the most accurate and secure identification of the spring the ID number should follow the spring through the manufacturing process. At Lesjöfors, each spring is clearly identified from the first production step until the inkjet identification number is applied to each single spring in the painting line.